Skyroam has a variety of WiFi choices from 24 hr unlimited daypasses, to Unlimited Monthly Subscription and our NEW GoData pay-per-GB subscription. All without contracts or hidden fees and you can always buy more WiFi anytime! 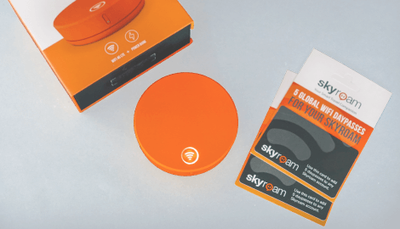 Spoil loved ones with the whole package – Skyroam Solis with a handy travel case and 10 daypasses of global WiFi to use anytime, anywhere around the world. + What's in the box? 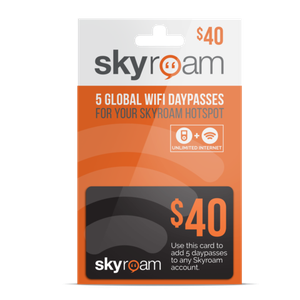 Use this pre-paid card to load 5 global WiFi daypasses to any Skyroam account. Buy more daypasses anytime from your device account portal. Learn More. Tax and shipping applied at checkout. To ensure your order is not interrupted, please avoid refreshing the page or clicking back to the previous page. Skyroam is a global service, and we deliver internationally. Visit one of our retail partners around the world.